Howdy, welcome to a western experience you won't forget! Step back in time and into our re-creation of The General Store of the American West. Watson's Wild West is one-of-a-kind and entertaining for all ages! There's no other place in America like Watson's Wild West. 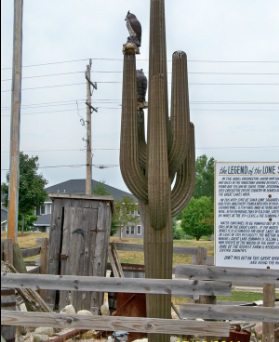 Try your luck pannin' for GOLD at the Tumbleweed Mine. Enjoy Entertainment by a Cowboy Character, who presents Tall Tales, Dr. Quiggley's Medicine Show, Cowboy Poetry, Humor, a Historical perspective of those times and events, and the thoughts of Will Rogers. So all you whippersnappers, push through the Saloon Doors and belly up to the bar for an ice cold Sarsaparilla (Root Beer) slid down the bar; and be enthralled by your visit to this great place. The General Store is a "Footprint of the past". 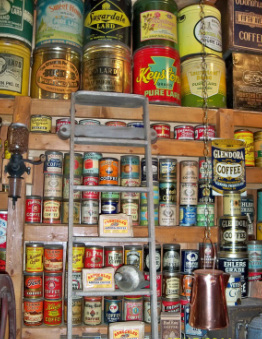 The shelves are fully stocked with hundreds of Antique Tin Containers and has sections for: Coffee, Tea, Confections, Peanuts, Crackers, Staples, Lard, Medicines, Toys, Hardware, Tools, and Oil Lanterns. There are displays of Horse Tack, Saddles, Boots, Copperware, Ox Yokes, Bear Traps, Toys, Big Little Books, etc.. Enjoy the Old West Post Office, Bar with its beautiful Bronze Cash Register, and Blacksmith Shop. The store is surrounded by Cowboy Artifacts of the 1880's. High Back Saddles, Chaps, Spurs, Branding Irons, Firearms, Holsters, and Mounted Game of Buffalo, Elk, Moose, Bear, Wolf, and Mountain Lion. Now Pardner, saddle up and mosey on over. And let your imagination roam. Take a panoramic 360 degree look at our museum. You need Adobe Flash to view this.